Description: Newly painted unibrow horsehead CR re-paint leads a westbound load though Scott AFB. Description: I believe this train is near Frankfort Jct. Description: Waiting to go north at Martin St. in Folkston Ga. Description: An eastbound train is passing through CP TARA near Hummelstown, PA. Description: Another One Unit Wonder! A single, lone ex-CR -8 commands the 64J at Tulp. Description: A westbound with empty hoppers passing the former RDG station. Built 1910. It has been saved and is now a Lionel shop. Description: 26T heads west at CP-435 on the NS Chicago Line. Description: NS 26T heads westbound toward Chicago at CP-435 on track 1. Description: A westbound on the NS Frankfort District just past IN 37 crossing. Description: 144 heads slowly toward CP 78. 144 struck an abanonded car on the right of way in the dark. 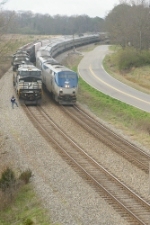 Description: Splitting the signals on the NS main in Decatur, Illinois. Description: Lehigh Road, 0616 hours. Title: NS 8387 heading East towards the MOW at Simpson Siding.